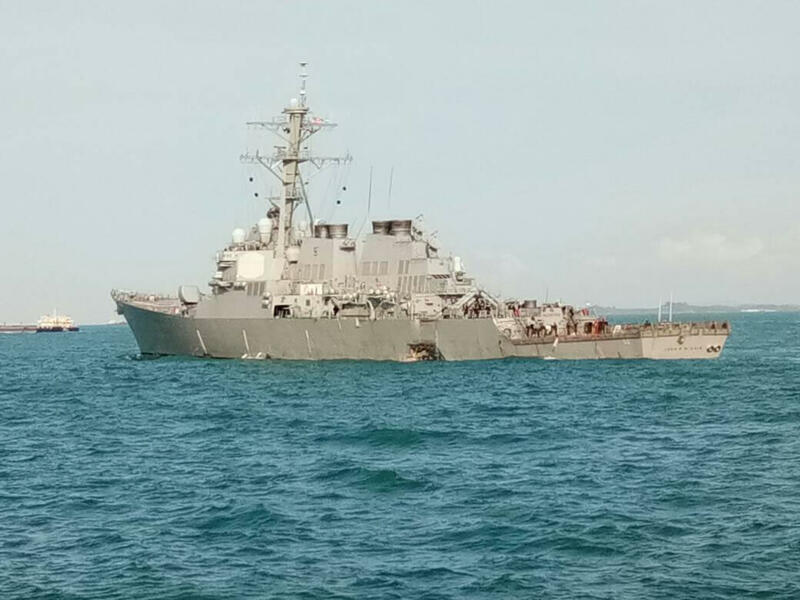 The USS John S. McCain, a guided-missile destroyer, was involved in a collision early Monday with a oil tanker east of Singapore and the Strait of Malacca resulting in damage to its port side aft (left rear), according to the U.S. Navy. Search and rescue efforts are underway, U.S. Navy's 7th Fleet says. Officials say 10 sailors are missing and five are injured. They say that four of the injured were medically evacuated by a Republic of Singapore Navy Puma helicopter to a hospital in Singapore for non-life threatening injuries. The fifth injured sailor did not require further medical attention, according to officials. The Singaporean Navy is sending assets to assist and the USS America is en route to help. The collision was reported at 6:24 a.m. local time, the U.S. Navy says. "In addition to tug boats out of Singapore, the Republic of Singapore Navy ship RSS Gallant, RSN helicopters and Police Coast Guard vessel Basking Shark are currently in the area to render assistance," the Navy's statement read. USS John S. McCain is sailing under her own power and is heading to port, the Navy added. Senator John McCain sent the following message on Twitter in response: "Cindy & I are keeping America's sailors aboard the USS John S McCain in our prayers tonight." President Trump reportedly was informed of the collision Sunday night after returning to Washington and responded by saying "that's too bad," according to a print journalist part of the pool traveling with the commander-in-chief. Malaysia's navy chief Ahmad Kamarulzaman Ahmad Badaruddin tweeted that two Malaysian naval ships were deployed to help look for the missing U.S. sailors, The Associated Press reports. The ship was on its way to Singapore after finishing what the Navy called "routine patrols" in the South China Sea. One of those patrols was a Freedom of Navigation mission near contested islands which China has built and claims as their own in the South China around August 10. The Navy says the USS John S. McCain was commissioned in 1994 and carries a crew of 23 officers, 24 chief petty officers and 291 enlisted sailors. It was named for John S. McCain, Sr. and John S. McCain, Jr. who were both Admirals in the U.S. Navy, Reuters news agency reports. Senator McCain -- a Vietnam-era naval aviator who was shot down and held as a prisoner of war for nearly six years -- is currently undergoing treatment for brain cancer. The vessel that was struck, Alnic MC, is a 30,000+ ton oil/chemical tanker built in 2007. It's 600 feet long and 105 feet wide and sails under the Liberian flag. Its owner according to searches is Energetic Tank Inc. and its operator is Stealth Maritime Corporation S.A. The Singapore government said no crew were injured, but it did incur damage to a compartment at the front of the ship some 23 feet above its waterline, AP writes. A crew member from the Alnic MC spoke with the Reuters news agency over the phone to say that there were nearly 12,000 tons of fuel aboard, but there was no spill. "There is no oil spill. We were carrying fuel oil from Taiwan to discharge to Singapore ... We are proceeding to Raffles Reserved Anchorage where the owners will investigate the matter. There was some damage to the valve," the unidentified crew member told Reuters. Officials say an investigation is underway. The extent of damage and personnel injuries is being determined. Meanwhile, the 7th Fleet has setup phone numbers for family members to call: on base at 315-243-1728 and internationally at 011-81-46-816-1728. AP writes that the Malacca Strait is between Malaysia to the northeast and Indonesia to the southwest, with the city-state of Singapore at the tip of the Malay Peninsula. This collision comes on the heels of another incident involving the USS Fitzgerald. The captain of the destroyer, two senior officers and at least a dozen sailors are being disciplined for the horrifying collision that killed seven sailors in June off the coast of Japan. Thirty-five sailors were asleep in a compartment when the bow of the Philippine ship punched a 17-by-13 foot hole in the Fitzgerald's hull. Seven sleeping closest to the hole drowned but 28 somehow made it out alive, even though the entire space was nearly flooded within 30 to 60 seconds.